Maui is regularly voted the #1 island destination in the world. Yet, most visitors never discover a fraction of the great experiences the island has to offer. The new Maui HI! Tour Guide CD-ROM allows visitors to fully explore the island from any computer with a tray-loading CD-ROM drive, anywhere, anytime. With 450 large photographs and honest descriptions, viewers can take a digital vacation through all Mauis sights, beaches, golf courses, restaurants, hotels and shopping. There are sections on whale watching, water sports, helicopter tours, tennis, horseback riding, hiking, night life, artists, galleries and Hawaiian culture. And, as they say, much, much more. Maui is regularly voted the #1 island destination in the world. Yet, most visitors dont discover a fraction of what the island has to offer. People keep asking us what are the best things to see and do. says thirty-year resident Keith Gilchrist. To help everyone discover and enjoy Maui, Keith and his wife, Parashakti, built a pocket-sized Maui HI! Tour Guide CD-ROM. The authors personally visited hundreds of locations, took 450 photographs, wrote honest, accurate descriptions and recorded the sounds of surf, whales, dolphins and birds to produce a comprehensive guide to Maui. Anyone planning a trip, wanting to revisit vacation memories or just dreaming of Maui can take a digital vacation through all the major tourist attractions like Haleakala Crater, the road to Hana, Iao Valley, Lahaina town, as well as, check out 43 beaches, 16 golf courses, 50 choice restaurants, 14 favorite hotels and 45 places to shop. There are sections on whale watching, water sports including sailing and kayaking, helicopter tours, tennis, horseback riding, hiking, night life, artists, galleries and Hawaiian culture. Audio files of surf breaking, whale and dolphin talk, Hana waterfalls, jungle rain and evening bird song bring home the sounds of the island. Listings of over 100 free or affordable things to do on Maui and a calendar of events are included, along with gorgeous photos of tropical flowers, sunsets and moonsets. To assist further exploration, hundreds of links connect to web sites all over Maui. The Maui HI! 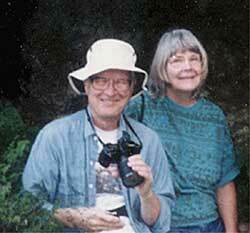 Tour Guide CD-ROM was developed by the husband and wife team of Keith and Parashakti Gilchrist who have lived on Maui for thirty years. Keith Gilchrist is a semi-retired management consultant and multimedia producer. Parashakti Gilchrist is an artist. The Gilchrists do not solicit or accept payment or perks from anyone. The CD-ROM is designed to play in any Windows or Macintosh computer with a tray-loading CD-ROM drive. The Maui HI! Tour Guide CD-ROM sells for $12.95 plus shipping and is available from their Maui HI! web site (www.mauihi.com) through Amazon.com and selected book and gift stores. Maui is regularly voted the #1 island destination in the world. Yet, most visitors dont discover a fraction of what the island has to offer. People keep asking us what are the best things to see and do. says thirty-year resident Keith Gilchrist. To help everyone discover and enjoy Maui, Keith and his wife, Parashakti, built a pocket-sized Maui HI! Tour Guide CD-ROM. 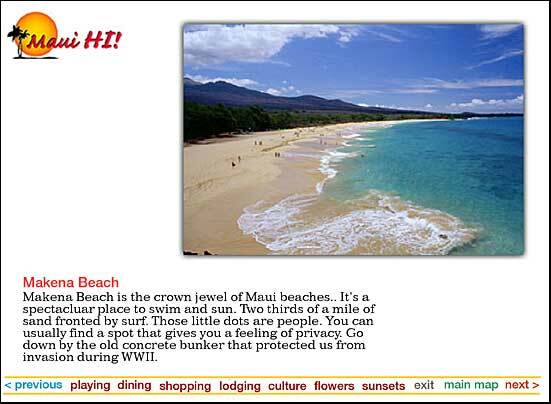 The CD-ROM allows visitors or anyone just dreaming about going to Maui to check out beaches, restaurants, activities and sights on the island from any Windows or Macintosh computer with a tray-loading CD-ROM drive, anywhere, anytime. The CD-ROM sells for $12.95 plus shipping and is available from their Maui HI! web site (www.mauihi.com) through Amazon.com and selected book and gift stores. Viewers can take a digital vacation through all the major tourist attractions like Haleakala Crater, the road to Hana, the Iao Valley and Lahaina town, as well as, check out 43 beaches, 16 golf courses, 50 choice restaurants, 14 favorite hotels and 45 places to shop. There are sections on whale watching, swimming, surfing, windsurfing, scuba, snorkeling, sailing, kayaking, helicopter tours, tennis, horseback riding, hiking, night life, artists, galleries and Hawaiian culture. Audio files of surf breaking, whale and dolphin talk, Hana waterfalls, jungle rain and evening bird song create the background sounds of the island. 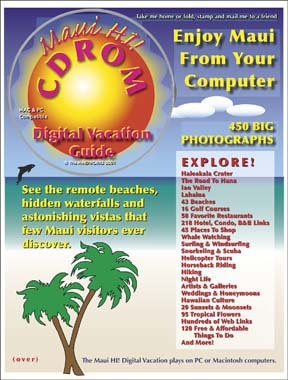 The CD-ROM lists over 100 free or affordable things to do on Maui, a calendar of events, 95 photos of tropical flowers and 20 sunset or moonset shots. To assist further exploration, there are hundreds of links that connect to web sites all over Maui. The authors personally visited the locations, took all 450 photographs, wrote honest, accurate descriptions and recorded the sounds of surf, whales, dolphins and birds. The Gilchrists do not solicit or accept payment or perks from anyone. 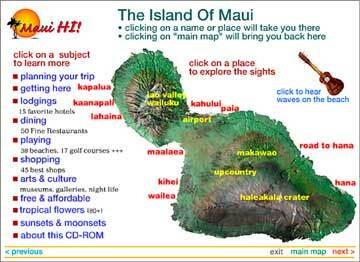 Anyone planning a trip, wanting to revisit vacation memories or to share Maui with their friends can simply take the disk out of their pocket, drop it into a tray-loading CD-ROM drive and watch Maui appear on their screen. Produced with family adventures and budgets in mind, the Maui HI! Tour Guide CD-ROM helps families plan their trip by learning about the places they are going to visit and the islands activities. There is money-saving, practical information and tips on travel for the physically impaired, for seniors, and for people with children, as well as wedding and honeymoon planning. Maui HI! Tour Guide CD-ROM is a 2 X 3 1/2 cardisc in a plastic sleeve. The cardisc and sleeve are inserted in a 7 X 10 4 color card stock mailer which is protected by a sealed plastic bag. The mailer can be folded and sealed with an enclosed seal, then addressed, stamped and mailed by USPS Priority mail for $.34. The retail price of the Maui HI! Tour Guide CD-ROM is $12.95. Volume discounts are available for distributors, book, gift and other retail stores. A countertop display is available at no charge for inital orders. Keith Gilchrist is a semi-retired management consultant and multimedia producer. He has thirty years of experience in management and marketing consulting projects for Fortune 500 companies. Mr. Gilchrists recent experience includes writing and production of an infomercial for Lookworks, Inc., writing and production supervision of videotapes on long term financing and on Alzheimers disease in seven languages, writing and production supervision of a videotape on the State of Hawaii videoconferencing centers, development of the SAGELINE multilingual audiotex service as well as interactive multimedia development and production projects. Parashakti Gilchrist is an artist whose work has been shown in solo and group shows at the Hui Noeau Visual Arts Center and the Lahaina Arts Society as well as in exhibits and juried shows such as Art Maui and the Statewide Juried Art Exhibit. "It was the sublimest spectacle I ever witnessed and I think the memory of it will remain with me always." Just wanted to let you know that your CD is pretty cool. I have been there 3 times before but my husband has never been. I am so looking forward to being able to share all the sights and beautiful scenery with him. Your CD has got both of us excited about our trip. Thank you for putting this together so we know all the places to see. Just returned from the most beautiful vacation we've ever experienced! I am not ready to be "home" yet, so I am playing my Hawaiian music and crying as I write this. I can still feel the soft breezes and see the palm trees and imagine the sunsets. Thanks for having this CD for me to savor our trip of a lifetime. Maui is a paradise on earth and we have traveled all over the world, but never to Hawaii. We thought Bali was "it," or maybe Paris or Prague...but, Maui touched my heart. I could go on...It was lovely. Aloha!